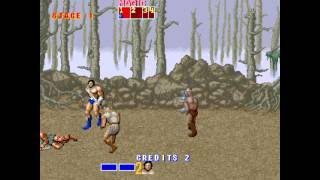 Play Golden Axe (set 6, US, 8751 317-123A) online with Arcade browser emulation for free! 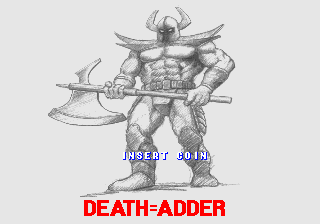 Golden Axe (set 6, US, 8751 317-123A) (MAME) game rom is loaded with features in our flash, java and rgr plugin emulators. Nothing to configure, we've done it for you! Sorry fellow, but you lost to a chicken-leg. 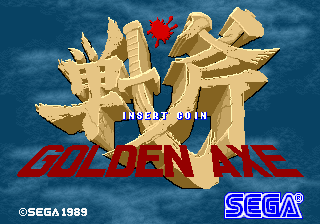 Sega's 1989 Golden Ax has five levels of sword or ax slash em up action! Pick between three heroes each having different magic abilities and strengths, plus each character has a special attack. 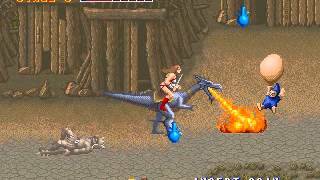 Plenty of enemies and bosses, plus creatures that you can ride on, such as a red dragon that hurls fire balls across the screen, a blue dragon that breathes fire on the ground and a wingless bird type creature that whips its tail at enemies. Having only five levels and it is a pretty straight forward game, I still rated the depth pretty high because the three heroes have different magic and strengths. The girl warrior has the most powerful magic (fire) and is pretty fast but is weaker then the others. The dwarf has the lowest magic (lightning) but he has the strongest regular attack. 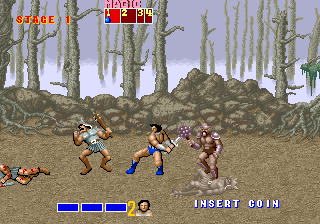 The barbarian has medium level magic (earth) and medium strength and speed.Character attacks include a running attack, two different jumping attacks and a special attack that is different with two characters. 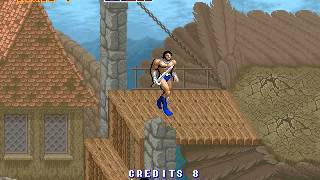 So after beating this game with one character it is fun to play as the other two as well, adding to the depth of the game. 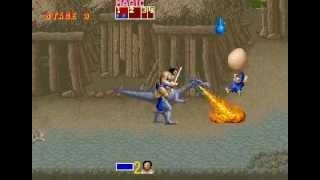 A great game, if you like beat em up games then I definitely recommend playing this one. The music is cool, player control is good and the graphics and boards are nice, so yea I gave it an 8. 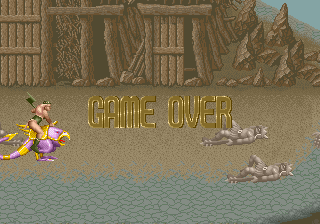 The enemies and boards are well drawn or pixelated. Plenty of different enemies, some are the same but different levels of the same enemy are coloured different according to their strength level. The different types and levels of magic each hero possesses are fun to watch. 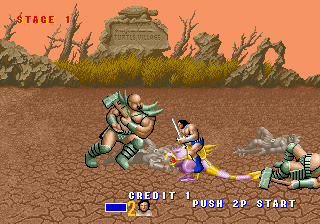 Some of the boards are pretty unique adding to the graphics and the overall score of this games rating. The only thing missing is voice affects, other then that this game has cool barbarian song tracks that fit the game nicely. 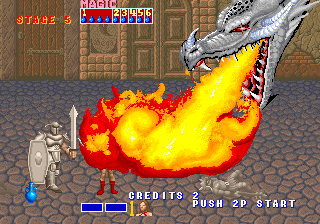 Other sound effects included in attacking, using magic and when you eliminate your enemies. Kind of a low score for a great game but after you play the game with all three characters and see all the levels of magic, it's a pretty done deal. While it is a fun game to play I rated the replay value a 7. Although I'm hard to please with most video game stories and this game has a typical bad guy takes the king and queen hostage, I rated it pretty high just because of the little things in the story like the elves that give and take magic from you, multiply and unique enemies and the beasts you can control add to the score of the story rating. 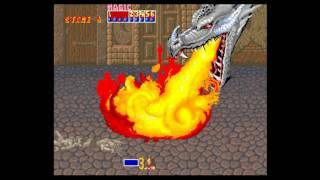 This game can be challenging unless you have an endless amount of quarters to spend. 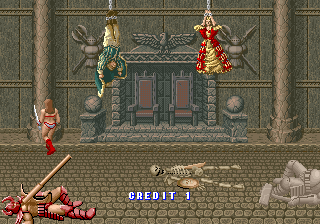 The player controls are good and the enemy's patterns aren't that hard to figure out, it is just a challenge to beat, witch is a good thing.